Of all the Burning Man Principles, ‘Radical Self Expression’ has the most resonance to me. How can I truly express myself, when I don’t even know who I am? Our world, our society and our own identities are so often defined by the company we keep, our socio economic backgrounds and, more than ever before in this generation’s lifetime, our political outlook. At this time, it is vital for us to discover, question, explore, follow, develop, become our true inner self, and for our contemporaries to not only accept but to celebrate our individuality. It is not the time to conform to others. It is the time to confirm who you are and who you want to be. The Mandalarium is an intimate, ritualistic experience, encouraging the individual to engage with their true inner-self through the ritualistic process of personal or collective meditation. This geometric mandala’s relationship with the sun represents the seemingly eternal struggle to understand one’s true self. The Mandalarium erupts from the earth like a fallen temple. A typical temple, pointing to the heavens, is challenged- the Mandalarium inclines towards the sun. The Mandalarium is not intended as a religious sculpture, but a sanctuary of the self. 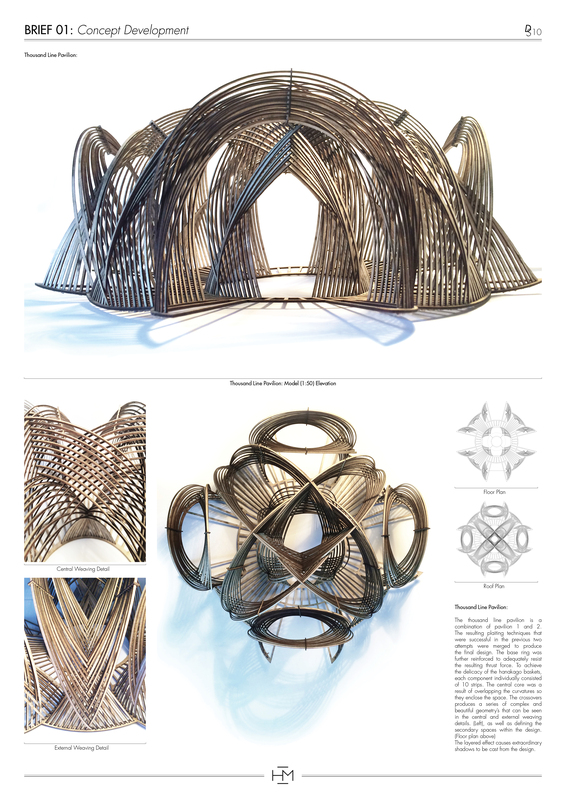 The meditative cupola is comprised of hundreds of reciprocal rattan pieces, rhythmically constructed, as with a mandala. Supporting and grounding this inclined net is a series of columns, creating a semi enclosed environment within which to meditate. 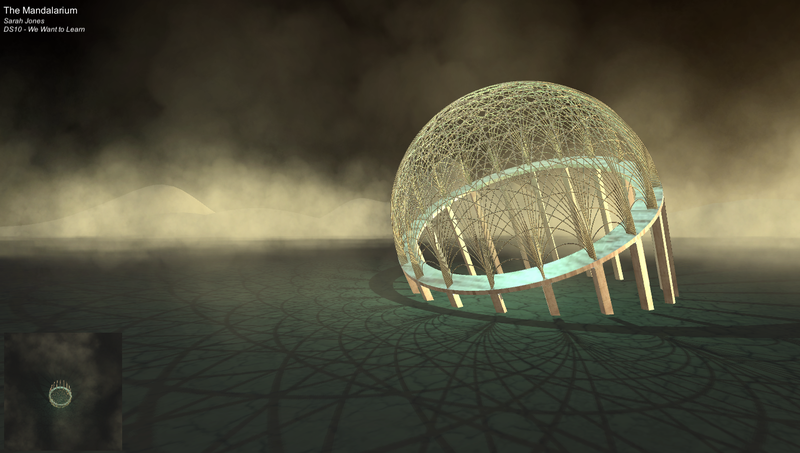 Participants may feel cocooned and comforted within this circular structure. As the sun glides along the playa, the shadows formed by the intricate layers of the Mandalarium are distorted, extruded and extended. At midday the sun will align so that a true shadow of the structure is cast- its true inner self is realised. The Mandalarium will be colourfully lit at night, encouraging participants to rest and meditate a while. To experience an interactive ‘walk through’ of the current concept, please download the Unity clip (and supporting files) below. 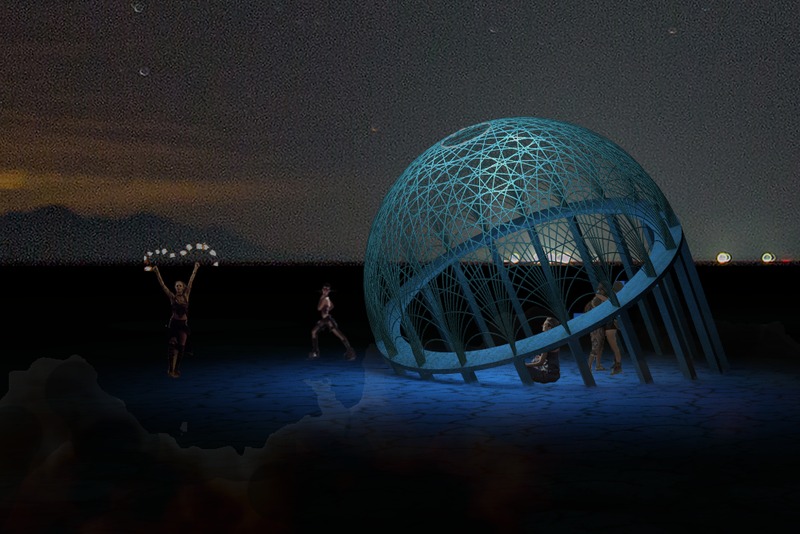 The interactive clip offers an insight into the transforming illumination as a day on the Playa progresses. 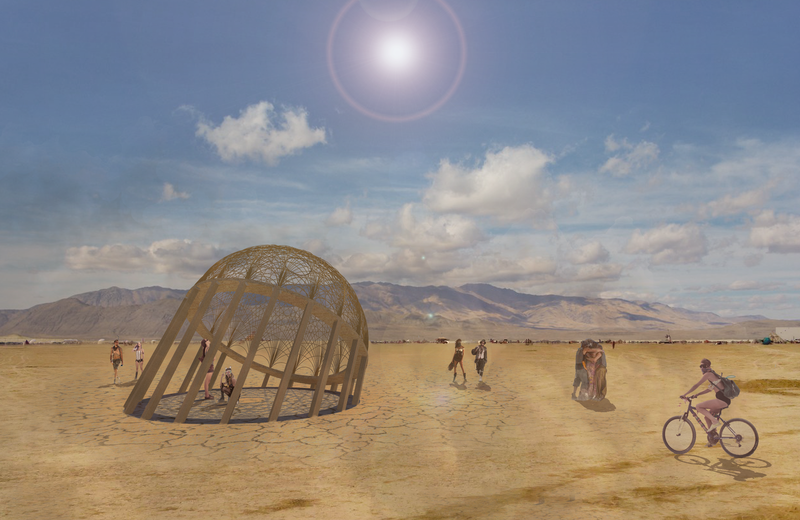 Every ten seconds in real time represents one hour on the Playa, although the lights at night time are shown to gradually change as proposed in real time. Experience the Playa for 24hrs from midnight on 27th August 2017. You will not need to download any programs to run this Unity viewer, just launch full screen and control the walk through with the WASD keys and your mouse! A special thanks is extended to Ross Cairns for his Unity introductory workshop organised during the University of Westminster’s ‘Play Week’. Carl Jung (1875-1971), the psychoanalyst who developed many original theories still respected today, was intrigued by the idea of the self and the subconscious. Jung believed one would be able to access emotions and ideas which had been repressed or that one had been unaware of by drawing a mandala, which he had encountered whilst studying eastern religions. It is believed that drawing mandalas reaches an aspect of our subconscious, reveals our central focus and leads to individuation. The mandala originated in India, developing through the teachings of Buddhism. In Buddhism, by drawing the mandala and being fully focused on the task, one seeks to understand one’s inner-self and brings oneself closer to a higher being. Any mistakes indicate that complete attention was not given, and one must start again to gain complete understanding. 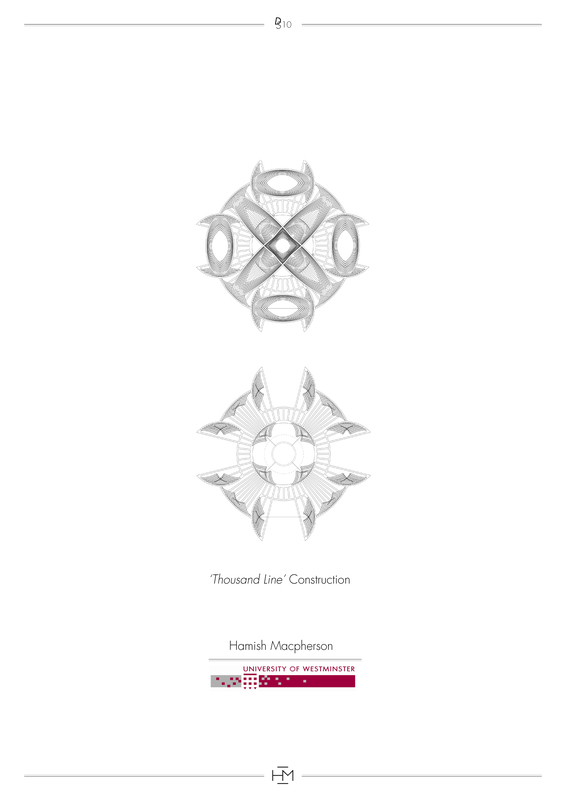 Mandalas are also present in Hinduism, however they are more purely geometric, with limited images of divinity and ‘iconographical representation’ (Tucci, 1961). 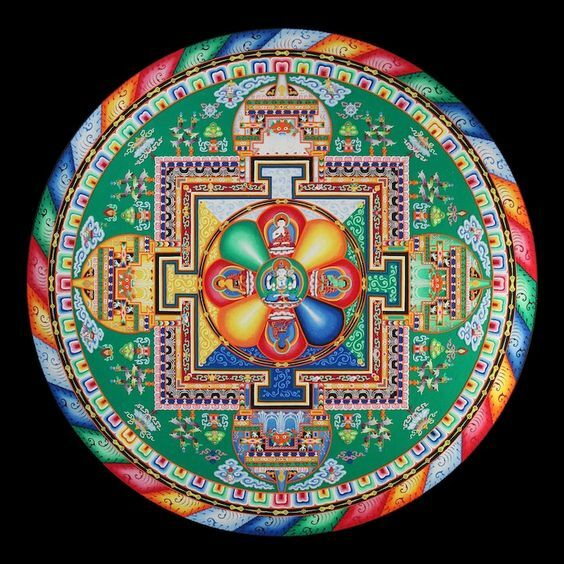 It is interesting to consider the spiritual and religious origins of the mandala, to attempt to understand its construction from a sacred perspective. However, my own mandalas will not seek to replicate this religious spirituality, for any attempt would be a clear and particularly incongruous cultural appropriation. 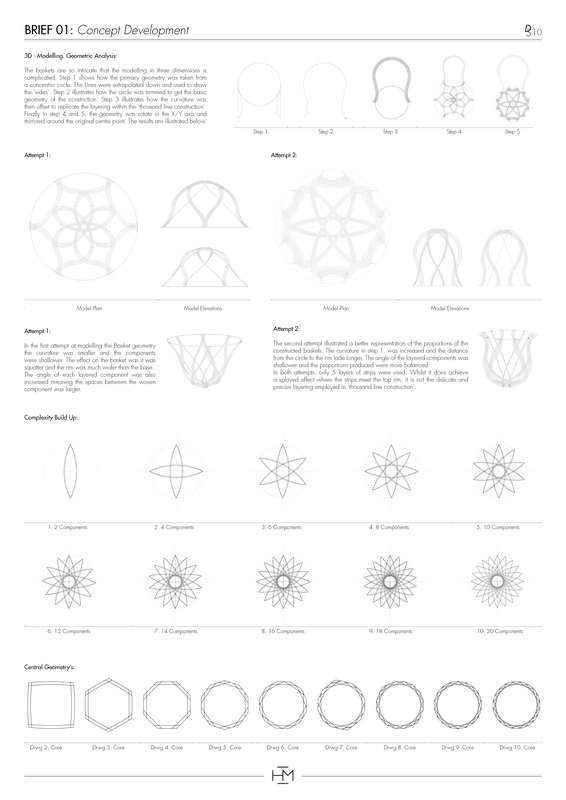 This exercise seeks to explore how the mandala form (and on a broader scale, the circle), can represent inner self as a route to self expression. 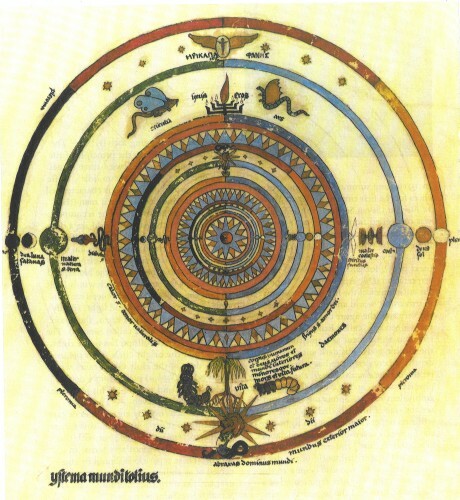 Utilising the knowledge of Giuseppe Tucci, I have sought to analyse a mandala according to the theories outlined in his book “The Theory and Practice of the Mandala”. Tucci (1894-1984) was an Italian scholar, specialising in Buddhist studies and Tibet. 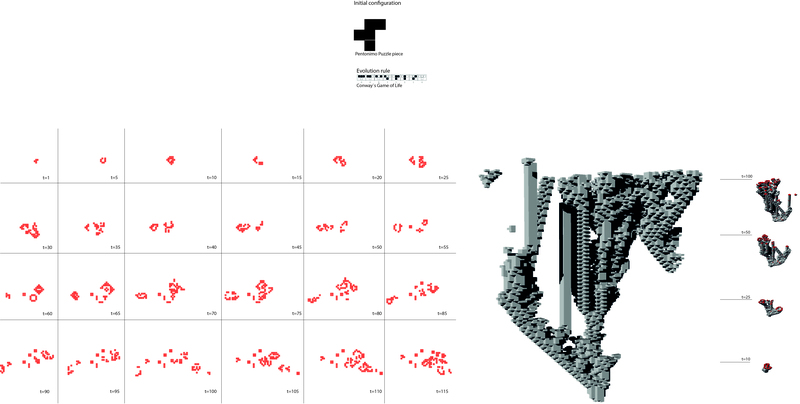 The symbolic concept of self is explored through an intricate geometric system, developed through theological and psychoanalytical research as demonstrated above. 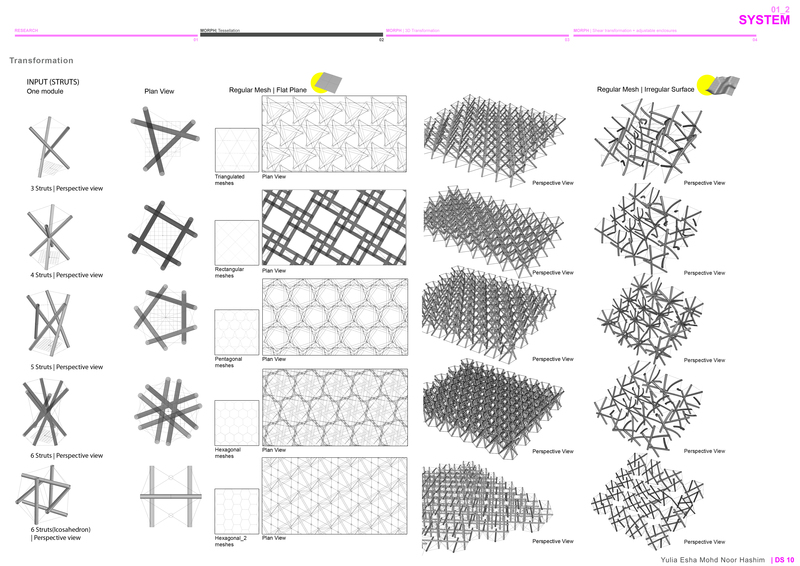 The below diagrams indicate this geometric system, its origins by identifying the steps of mandala creation and defining a geometric rule to this order. As explored in the right hand column, the aspects of a traditional mandala can be articulated within the geometric steps. It is the intention that participants may identify this, but also that they will visualise images, tangible or otherwise, which may unlock an aspect of their innerself; much as a shape in a cloud is identified differently by two individuals. 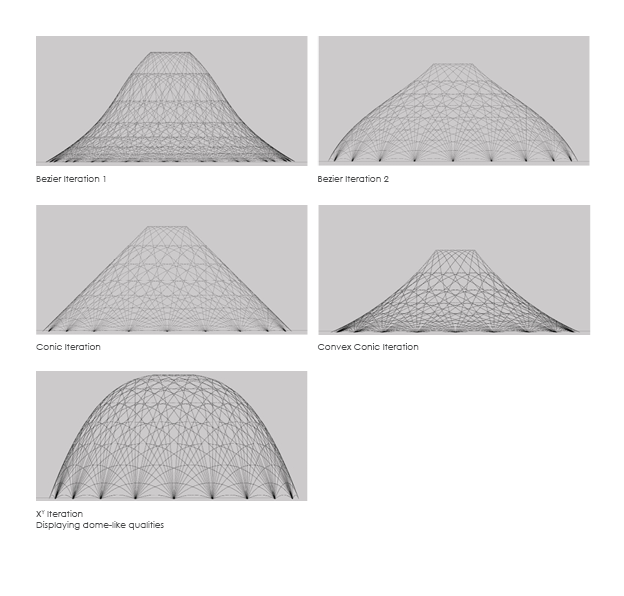 Using parametric design to explore 3D extrusions of the mandala net, it became clear that a dome-like, hemi-spherical structure strongly reinforced the ideology behind the design. 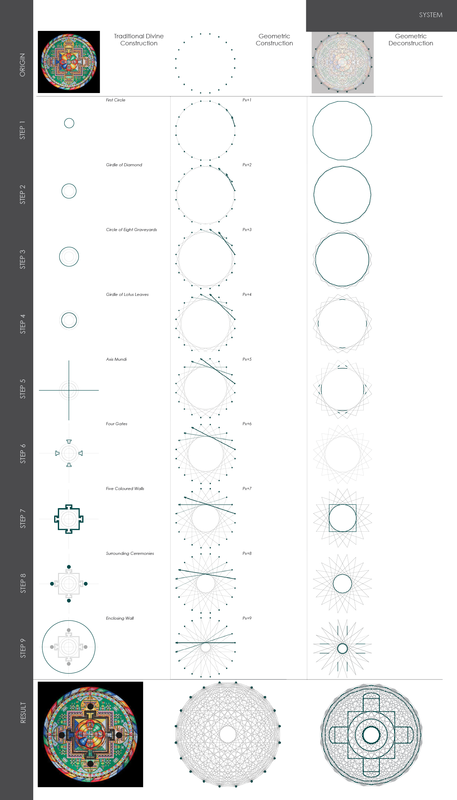 An exercise in exploring the historical and cultural significance of the dome, including the world renowned Pantheon and the Hagia Sofia, demonstrated the religious and political power the dome has the potential to emanate. 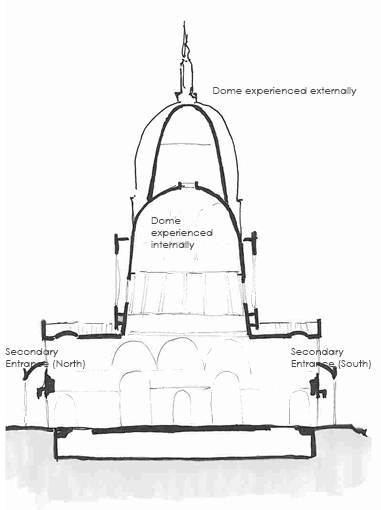 Throughout history, domes were built by vastly rich, political figures, using domed structures to show their connection with God and religion and as a means of demonstrating their wealth. A significant dome structure in London is St Paul’s Cathedral, which was designed by Christopher Wren and completed in 1708. A visit to the Cathedral confirmed to me the spiritual feelings one experiences when entering such a vast and astonishing place. The dome is a space of reflection. At St Paul’s, the eye is immediately drawn upwards to the heavens. The focus of reflection is clear. Perhaps the most intriguing aspect of St Paul’s Cathedral is the perception of the dome from the interior and exterior approach. The exterior dome extends far higher than the dome perceived from the inside of the cathedral. 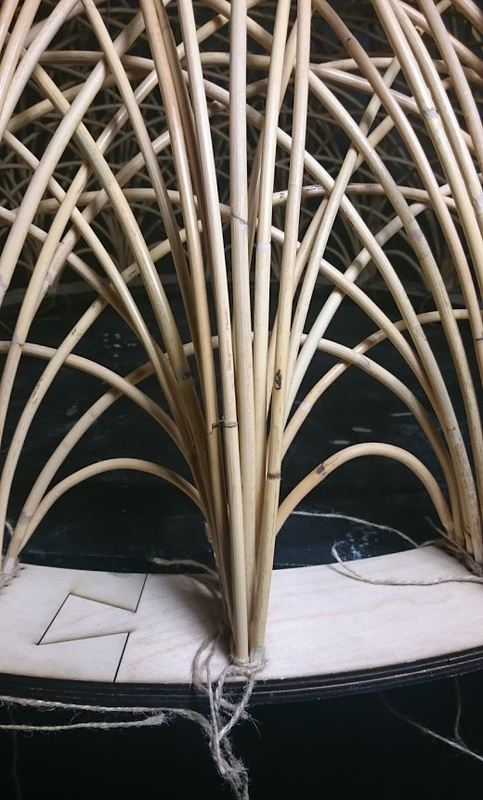 The two domes are not a true reflection or impression of each other, and this is something I have aimed to address within the design of the Mandalarium. 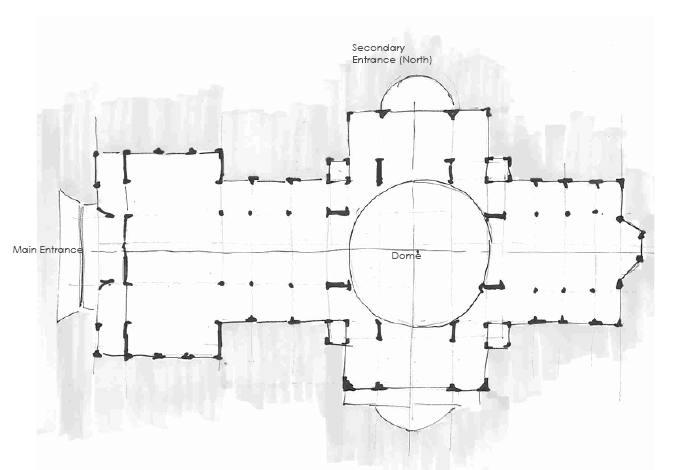 Aligning the Mandalarium seeks to remove the religious aspects of the dome design but retain the spirituality. The sun, the origin of all life, is orbited by the earth on a predictable path which has not changed for millennia. At midday, the art will cast a perfect shadow of itself; its true form is expressed entirely. But this moment is fleeting. 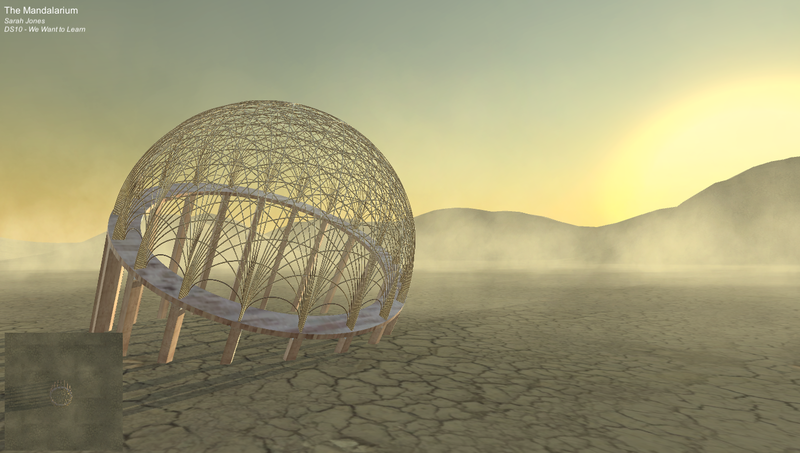 The shadow dances across the playa, aligning for mere seconds. Participants who are at the Mandalarium at the ideal time may embrace this moment, just as I hope every participant will truly understand their identity and own path in life; if only for a second. 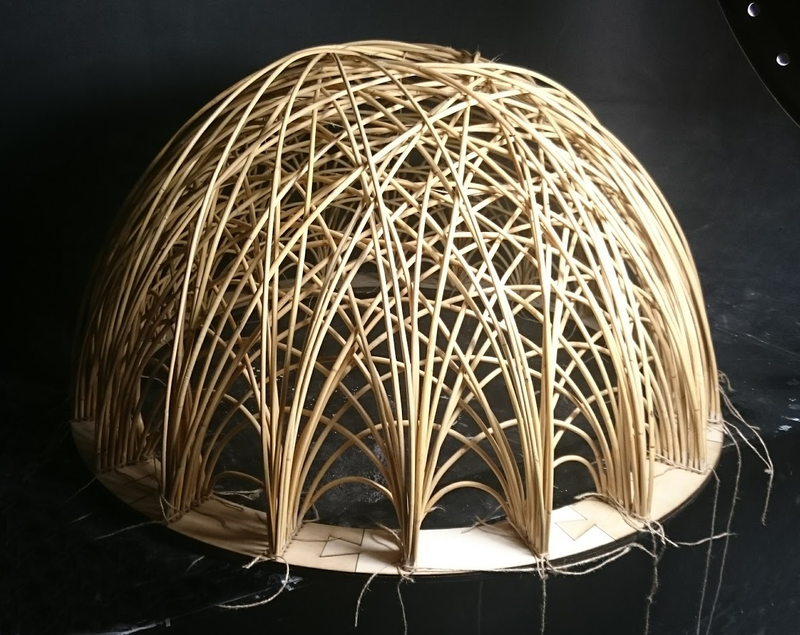 I constructed a 1:5 scale model of the dome aspect of the design, in order to explore potential construction techniques and the physical properties of my chosen material. 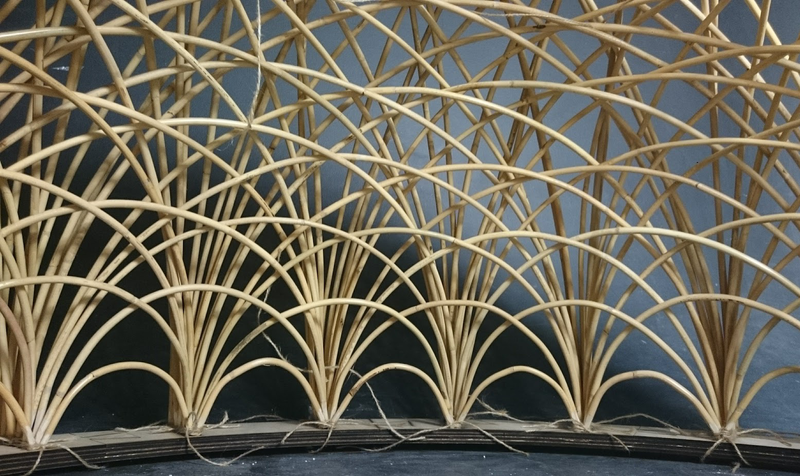 The dome is constructed with 180 pieces of kooboo cane, each soaked in lavender scented water and individually bent to retain a curved shape. 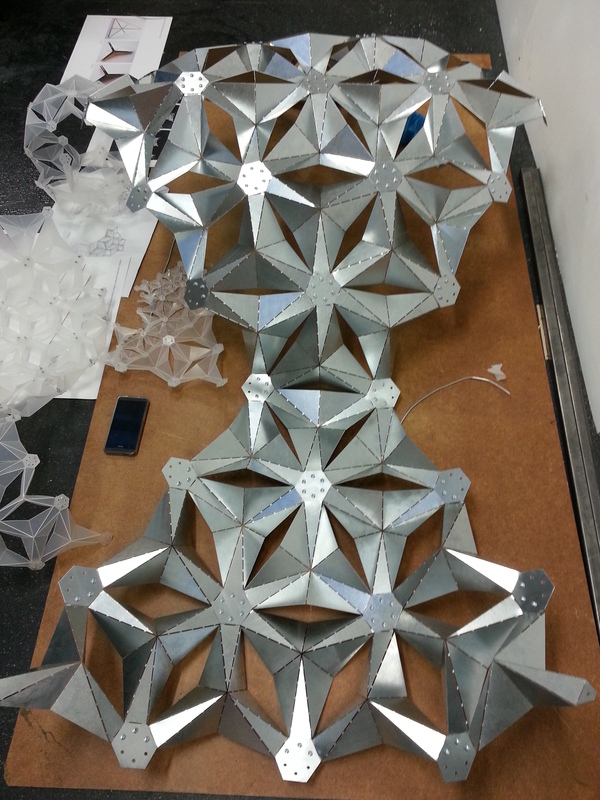 The pieces are then rhythmically positioned in nine layers within the base frame. 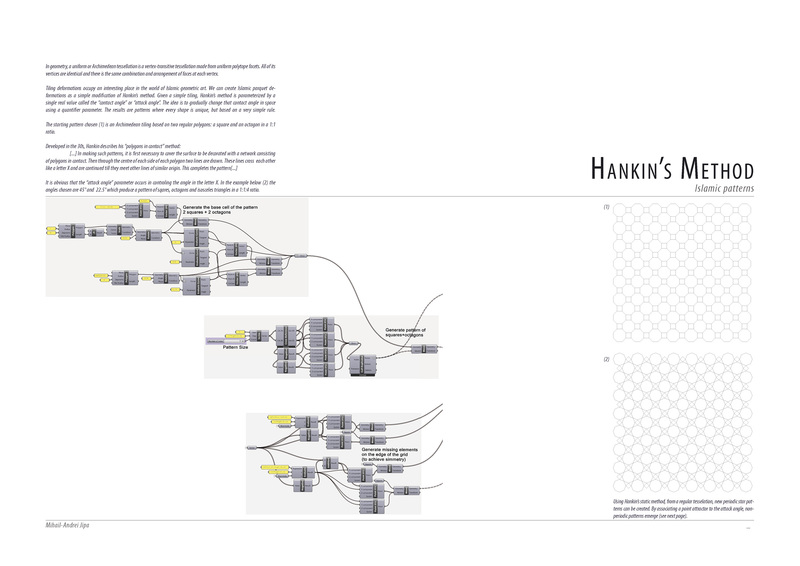 As the length of the pieces increase in size, the individual layers become reciprocal, each piece resting on the next. The subtle lavender scent creates a calming atmosphere when one sits within the structure.